God replied, “Okay, I kept a small piece of land full of rocks and mountains. I didn’t give it anyone else simply because it is useless. Take it and do what you want with it.” So the Armenians took this land and started to cultivate vineyards and orchards. And that’s why Georgia has the Black Sea, beaches, flatlands, and forests, while Armenia only has its rocky mountains and one small lake. That lake is Sevan, where we were heading. First we visitied Sevanavank, the monastery complex formerly located on an island. This is where the church sent sinner monks to cut them off from as many worldly pleasures as possible. In the 1930s, Stalin had a “master plan” to drop the lake level by twenty meters, and the island became a peninsula. Now the Armenians are determined to raise the level of the lake back to its original height, and so far they’ve succeeded with six of the twenty. The highway runs alongside the lake in some places though, and there are many buildings close to the shore, some of which have already been flooded. But in Armenia, the past is often more important the present. 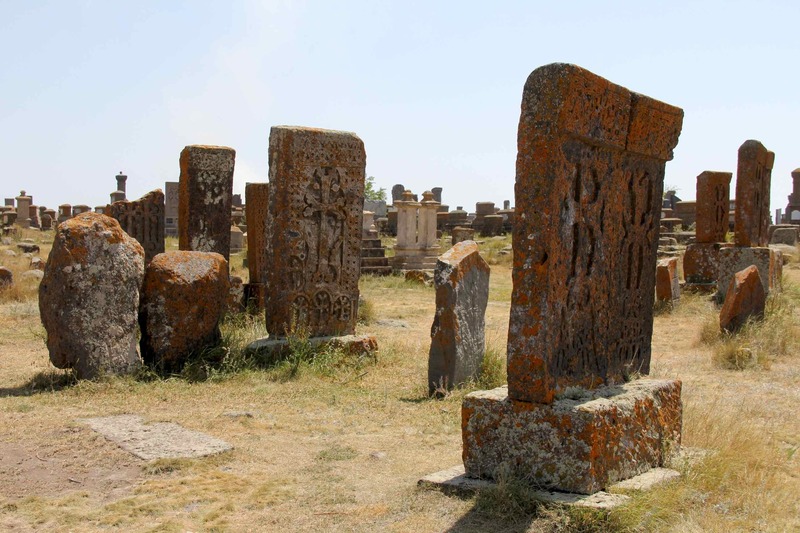 From Sevan, we ventured to Noratus, meaning ‘new house,’ a cemetery dating back to 800 CE with approximately 900 stones. One of its khachkars, the carved stone crosses, spent two years on exhibit in the Lourve. The French wanted to keep it, so the Armenian government had to write a letter requesting it back. It returned to Noratus in 2008. Arpini led us through the cemetery to decode the carvings on many of the stones. These carvings traditionally told a story from the life or, more commonly it seemed, the death of the buried individual. She entitled one stone’s story The Party Crasher, which seemed a shade too light-hearted for a murdered bride and groom, even if they did die 800 years ago. There was also the story of the drunken fisherman, whose death seemed too pointless to immortalize on his gravestone — but perhaps that was the only notable thing that happened to him in fifty years. Also perched on a cliff overlooking Lake Sevan is Hyravank Monastery, also called the Monastery of Human Doves. This name comes from a legend dating back to Tamerlane’s rampages (Tamerlane, or Timur-i-lang, was a Mongolian conqueror who claimed to be a descent of Genghis Khan. Actually, ‘conqueror’ is a loose term; he was more of a serial murderer with an army). When Tamerlane’s army approached, the local people ran to the church. The bishop had a piece of the cross on which Jesus died, and as people arrived, he touched them with this splinter of wood, turning them into doves that could fly away to safety. In actuality, the people survived by hiding in a secret tunnel under the church, a common feature of Armenian churches (perhaps for obvious reasons). Hyravank’s tunnel was cemented shut in 1983 by the Soviets, who, according to the guide, saw no use for it. With that, you have some insight into the layers of Armenian history, piled up and chaffing against each other.